Joseph Mallozzi's Weblog: July 8, 2010: Maverick (a.k.a. Mike Banas, P.I.) fires back at ya! July 8, 2010: Maverick (a.k.a. Mike Banas, P.I.) fires back at ya! When he’s not editing or working on his deck, Mike Banas is answering YOUR questions! No doubt intimidated by the fact that I would be visiting him to start work on my producer’s cut of Resurgence today, Mike magically turned around that outstanding Q&A we’ve all been waiting for. And it’s a good one. As is Resurgence, is latest labor of love. But you can judge for yourselves when it airs in about ten months. Well, hello everyone. First off I have to thank Joe for the invitation to participate and of course thanks to all of you for your thoughtful questions. Also, I should apologize for taking so long in answering. I usually get a bit of a breather between episodes to get caught up on emails and what not, but this time I finished Joe’s latest and greatest: “Awakening” and instantly launched into Rob Cooper’s “Malice” with no down time. MB: I’d have to say, by far, the pilot – Air pts. 1 & 2. It was challenging to edit mainly because we were working with more of a clean slate in terms of ‘look’ for the show. Having no template to work from opened up a lot of possibilities. Since we were all on a learning curve it took a lot of work to find the show’s style. What made my job easier and still does today, is our incredible cast. The performances are consistently spot-on, which allows me to focus on other things while I’m putting the show together. MB: Very. During the shooting of an episode the editor cuts the raw footage, or ‘dailies’, alone. We do communicate quite regularly with the director and producers during the shoot but the editor produces the first cut of the show, which contains everything that was scripted. After the Editor’s Cut, the episode’s Director comes in and spends a few days reworking the cut. Often they remember things from the shoot that really grabbed them, like a particular camera angle or line reading. 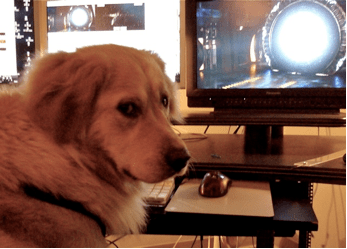 So when he / she is happy we release the Director’s Cut for the producers to watch and then the supervising producer (usually that episode’s writer) comes down to editing to work with me for a few days. After that it’s off to the network for their thoughts then the show gets ‘locked’, which means there will be no more picture changes, that’s when the sound and Vfx folk get busy. The whole process for the editor takes roughly a month for an hour-long episode. MB: Sure. Directing sounds fun. MB: I like to snowboard (winters off in British Columbia can be amazing). I am also a T.V and Film addict (I’m watching “The Wrath of Khan” while I’m typing this – Kirstie Alley!). MB: I grew up in the eighties listening to and going to punk rock shows. My tastes have broadened, but I am still drawn to bands that exist more or less on the fringe. Current favs are “Future of the Left” from Wales and “Titus Andronicus” from N.J.
MB: Unfortunately I can’t really speak to the editing of “Pain” or “Lost”. We have a three-editor rotation, so I cut every third show. Rick Martin and Brad Rines (two of the best editors in Canada) cut those shows respectively. What I can say is every episode is unique and the script and material more than anything dictates the style. As far as joining Twitter.…maybe….perhaps….well….the thing is, the idea of spending more time on my computer or phone than I already do scares me. Lou Zucaro writes: “How long have you been editing and have you worked in both traditional (analog) and digital and if so, is there anything you miss about working in analog? Have you ever made an edit you really regret making? If so, what was it? MB: I’ve been editing for about 12 years plus a few years working as an assistant editor. I began my career just as digital editing started, so I am among the first generation of editors that have never needed to handle actual film. So I have never seen anything literally hit the cutting room floor, it just vanishes out of my timeline on screen. I know editors who had to make that transition from film to digital and most feel that the new technology gives them the speed, options and freedom to experiment with a scene or show. It allows them to try more things. MB: Secret Easter Eggs? I’ll go to my grave before I say. MB: We now use Apple’s Final Cut Pro 7 on Mac towers running OS X Snow Leopard. MB: Time is probably my favorite episode. Rob Cooper misled me, however, before I read the script saying it would be an easy one to edit. He said it would be a series of single shot scenes that I would just have to string together. Well, it turned out to be a bit more complicated than that. He and I discussed while he was shooting the idea that the ‘fritzing’ Kino footage could jump in time as well as between performances with carefully chosen edit points within the glitches. An Idea I had was that the Kino should not only fritz forward but it should have small jumps in time backwards as well. If you watch the opening scene you can see the Kino image of our team walking down the ramp from the gate and small time jumps both forward and back as a subtle hint to what lays ahead in the episode. The “What The….” act out was great. Robert wrote it to be cut off like that but he had David Blue actually say the real sentence “What The F@#%!” with the idea that it would feel more authentic than if David cut himself off. The fun part was sitting in the cutting room listening to and comparing the dozen or so takes trying to pick the funniest, most realistic one. Also, it is probably the only episode I’ll ever work on that features footage shot with a camera stuck on top of a character’s head. Jeremy writes: “Question: Has the idea been discussed of keeping a copy of any long cuts of the show which the director is happy with before it has to be cut down to fit the allotted running time and the DVD being those long versions and not the broadcast ones? Or what are your thoughts about that if it hasn’t? MB: Because we have to cut down to a specific format length the writers try to make the scripts a bit longer so we have some room to play with. Often they will write a deliberately redundant line or scene knowing full well that it will hit the floor in the cutting room (figuratively speaking of course). Every step of the process the episode is being improved. So when the show is done, putting some of those things back in wouldn’t really improve it. Longer isn’t necessarily better. As an editor part of my job is to help figure out what parts of the show has to be removed to bring the episode down to the format length. When I watch movies I’m always thinking about what could be removed without adversely affecting the story. I believe audiences are more sophisticated than they were years ago. People can process story points with less visual information than in the past. So in answer to your question I do find quite a few films lately could lose a bit of weight. Tarantino, hmm. A couple of years ago I was doing a Kung Fu film in China with David Carradine. And one night over a drink we started talking about “Kill Bill”. I told him it would have made one terrific film instead of two mediocre ones. He called me an a**hole. MB: Yes, by getting them to think it’s their idea. PoorOldEdgarDerby writes: “Questions for Mike Banas: 1. Where did you go to school and what did you study? 2. How much of a change has it been moving from Atlantis to Universe considering the marked difference in show tone and appearance? 3. I see from your IMDb page you worked on “Young People F#@king.” Seeing as how a lot of your work has been in TV, how was working on a movie different? MB: 1) I went to the University of Toronto (where I’m from) and then transferred to Concordia U. in Montreal. Funny enough I was not film student. I was a History major. Friends of mine were in the film dept. and ultimately those friends were instrumental in me landing my first film job. 2) The transition from Atlantis to Universe has been a bit challenging. ATL was shot and cut in a more traditional style, which relied more on editing “rules”. Since SGU is shot in a handheld, documentary style it is very liberating. It allows the editor to be in any shot at any time regardless of size or angle. But with that freedom comes the expectation that we try more of those possibilities. So, it’s a bit more labour intensive. 3) Yes I cut YPF with the multi-talented Martin Gero. I had a blast doing it and I was proud to be involved in the film. Working on a movie is actually easier than a TV series for an editor. TV schedules can be pretty demanding and by the middle of the season we usually have multiple shows on the go in various stages of post. Features have a lighter shooting schedule. A television series will shoot on average 6-9 pages of the script each day, where as a feature is more like 3-5 pages (lead television actors are incredible in that respect. What they have to prepare themselves for on a daily basis is mind-boggling). There is also more time to massage the scenes because each stage of post is given more time. 4) I just assumed everyone played “Snifty Snakes” as a kid. I was on my high school varsity “Snifty Snakes” team. Maybe it’s just a Canadian thing. MB: Thank you very much Otros. – How did you get into visual effects as a career? – What courses did you take to learn your trade? MB: 1) Its actually a whole other department that creates the Visual Effects. The VFX are added after we finish editing the episode. 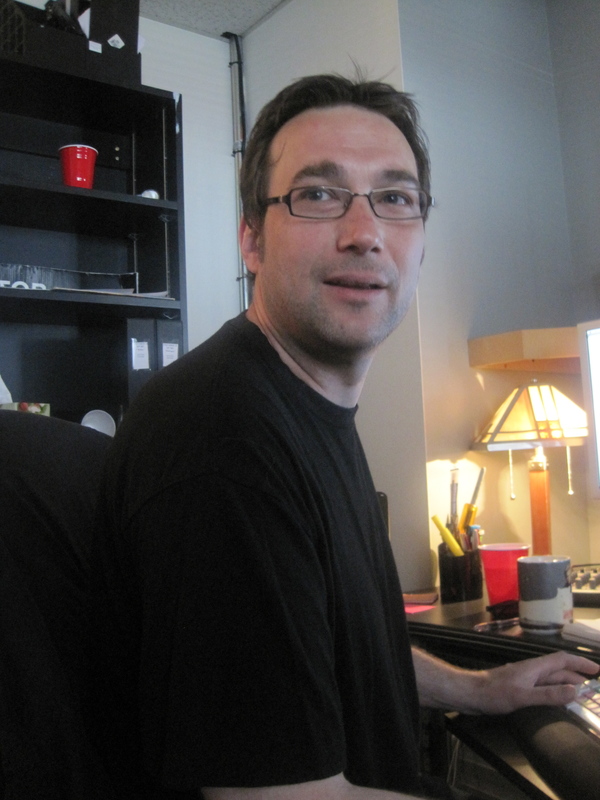 The very talented Mark Savela leads the VFX artists. When the shots are partially done we cut them into the show so that the producers and Mark make adjustments before they are delivered as Final Effects that end up in the finished product. 2) I actually learned on the Job. I was lucky enough to start in on the ground floor in the editing department on another Brad Wright series called the Outer Limits. I was hired to work in the tape room and make vhs dubs of the shows and the raw dailies for everyone (I also made the coffee). But, the first time I sat and watched an editor work I thought to myself: I must learn to do this! So I stayed late, came in on weekends, did everything I could to get my first show to cut. 3) The best part of my job is the day the footage stops coming in for an episode and I get to see the show all fleshed out from start to finish for the first time. The editor is the first audience member and I try to watch it with that in mind. It’s a privilege to be the first one to see the end result of so much hard work from so many people. I like that and ‘snack time’. Imadaman writes: “‘soup Mike! 1. What’s your favourite scene you’ve edited? 2. What’s your favourite episode you’ve edited? 1) My favourite would have to the opening sequence in Air Pt. 1. The scene where 100 or so Icarus Base personnel flying through into Destiny’s gate room. The stupendous Andy Mikita covered that with three cameras and shot it for several days. There are over 200 individual shots in that sequence and it took me about a week to cut. 2) My favourite episode to cut was Air but my favourite to watch is Time. 3) I unfortunately never worked as an editor on SG1. My favourite ATL show would have to be Vegas. That CSI style we paid tribute to can be a lot of fun for an editor. Tanie writes: “Ooooohhhhhh, a Q&A… woohoo!! 1. Did you have to apply for this particular job or do you work through an ‘agent’ for want of a better word? 2. How long have you been doing this for and what training did you have to undergo? 3. What’s your favourite ice-cream flavour? 5. Do you have any pets, and if so, are you able to take them to work with you? 6. How long are your working hours – we hear that the actors and production crew can work up to 14hr days. Are yours shorter or about the same? MB: 1) No, I don’t use an agent, although some editors do. I suppose Brad Wright and Robert Cooper liked my work and hired me based on my previous experience. 2) See answers to PoorOldEdgarDerby and Arctic Goddess above. 4) Joe and I worked together for the first time on ATL’s “Whispers”. We both had fun on that one and this season we’ve got a few shows together. As you are all aware, Joe is a very entertaining fellow. 5) Yes. 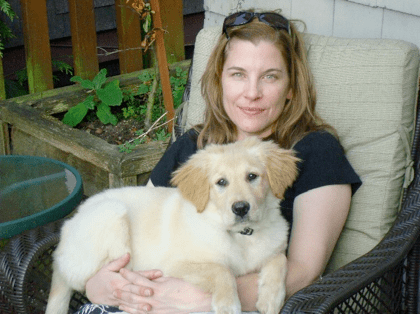 Ruby is our very sweet ½ Newfoundland – ½ Golden Retriever seen below with the beautiful and talented head of SGU Post Production – Jennifer Johnson (little known fact – she is also my wife of 15 years). 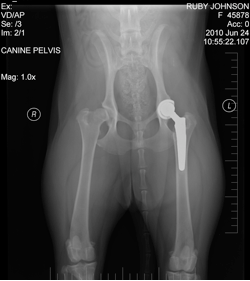 Unfortunately Ruby was born with bad joints. On her first birthday she got a new hip. This fall she’s going to get a second one. We are also going to try the stem cell procedure that was featured here recently. When it’s all said and done that dog will be more machine than beast. 6) Post has shorter days than the shooting crew. Depending on the types of scenes, it takes about 8-10 hours to cut the previous day’s footage. Also, staring at computer monitor that intensely for more than 10 hours can be a real strain. 1.) You won a Leo Award for Best Editing (congrats BTW) for your work on the SGA episode ‘Vegas.’ What do you think you did differently compared to your other SGA and SGU eps that made you recognized for that specific episode and how do you feel your methods used for Vegas compare and contrast with recent Emmy winners for Best Editing, such as the pilot episodes Dexter and Breaking Bad and the ‘ABQ’ episode of Breaking Bad? 2.) How could you use the full methods/techniques and editing concepts used for Vegas in each episode of SGU that you do? How do you envision them being implemented in each episode? MB: Vegas was a really unique episode because it takes place in an alternate reality where John Sheppard was a CSI type detective and we paid homage to those kinds of detective shows. We used ramped (sped-up) establishing shots of the city, jump cut sequences, flashy flashbacks, etc. to create that look. So, Because Vegas was a one-off, a great deal of those techniques wouldn’t fit with the less stylized ‘documentary’ look of SGU. But we do incorporate some jump cutting and montage elements into the show. And thank you for the good wishes. BoltBait writes: “Now a question (or seven) for Mike: 1. How close to air date do you typically finish your work on an episode? 2. How do you deliver your finished product? 3. Are you the one who sends the final product to the network? 4. After seeing your work on TV, have you ever wished you could go back and do it over again and fix something? 5. How much time are you usually given to do your work? 6. Do you typically work alone, or with lots of input? MB: 1) My work on an episode ends months before an air date. There is so much more that goes on once the picture is ‘locked’. The sound editors and mixers get to work, VFX starts putting their shots together, Joel begins composing the music, etc. 2) We send the network an HD master tape. 3) Jennifer Johnson and Kerry McDowell expertly handle every aspect of delivery. 5) The whole thing from the first day of ‘dailies’ to the ‘locking’ of picture takes about a month. 6) and 7) I cut the raw footage as it’s being shot alone but there is usually communication between the director and producers and myself. MB: You’re right Bananas is the plural not the possessive of Banas (That or Bani). Hey, why is everyone so down on Snifty Snakes? Actually it was a gift from one of our two assistant editors Ryan Malone. He and Steve McLeod are the best assistants in the whole world. (And now they both owe me a burger). MB: I too prefer Avid. We happen to use Final Cut on SGU for various reasons and there are definitely some advantages to using it. Any time that I’ve gone onto another show that uses Avid there are some elements of FCP that I miss. Any professional grade editing system gets the editor to the same place its just another tool. Well I think that’s it for me. I thank you all for your awesome questions and I appreciate the interest in what we do. People tend to forget about postproduction because we work in dark little rooms by ourselves like trolls. So it’s nice to shed a bit of light on the process now and then. Jon Anctil who keeps the shows coming and going on time. Troy Mac Neill who manages to keep a very complicated system running well. Bob Dewald whose eagle eye catches every potential problem. Ryan Malone and Steve McLeod for having to deal with me every day. Kerry McDowall who keeps the train on the track. And, of course, Jen Johnson who keeps us all in line. Previous Article July 7, 2010: Do NOT doubt the octopus! Ivon’s unnerving bad vacation mojo! In and around the office pics! Next Article July 9, 2010: Greek Day! Two Emmy Nominations for Mark Savela and our Visual Effects Department! Holiday-mode Louis Ferreira Starts Answering Your Questions! Thanks for the Q&A. As a junior editor myself I found this very entertaining and informative. I have no clue how someone can stop editing a show. I mean.. I’ve edited stuff a minute long and months later I’m still going back and tweaking it. Just wanted to also say how psyched i am for season 2. Because ive spent so much time on the campaign its been depressing seeing how many roads these movies could have taken but they didn’t, its just frustrating, and everytime I think of stargate I think of the movies and how they we’re greenlit and we heard they would certainly go into production at the end of the year and both movies were a go, but then it just fell apart… so now because of the campaign my enjoyment of stargate has been kinda killed… but recently ive realized I should be grateful for the awesome 16 seasons(almost 17) we already have and 2 movies… When I adopt this thinking I get much less frustrated and get really psyched for season 2. Joe, thanks for another great Q&A, and Mike for taking time to explain stuff, it makes more sense. some day we will have it all figured out,probably not, but its fun to learn the back stage secrets. thanks. and Joe, let us know about Jelly, any more news? @ganymede, thanks for the link to tim horton, cool. Many thanks to Mike for taking the time to answer all of those questions and his very informative behind the scenes look at the editing process. Thanks to Mike Banas for the interview questions – very interesting about the process of editing the Stargate series. I particularly enjoyed his discussing Vegas- my favorite ep! Joe, a couple of things. First, I don’t recall your posting Mr. Ferrera’s responses to folks’ questions? Did I miss it? Second, I downloaded Android’s Dream to my Kindle (finally), and am 1/2 way through. Can I just say – it’s hilarious and spine tingling at the same time, but also a little strange – which is right up my alley. The neat thing about it is, because it takes place near where I live, a lot of the stuff is very familiar to me. I cannot wait to finish it … I love his writing style … it’s one of the few books I’ve read recently that hasn’t put me to sleep on Amtrak between NY and DC – and that’s saying a lot. (The other book was Craig Ferguson’s biography – which was awesome in a different way.) Anyway, thanks for recommending it! LOVE LOVE LOVE hearing about the behind-the-scenes people who make my favorite show happen! Thanks to Joe for inviting Mike Banas, and thanks to Mike for stopping by! Congrats to SGU for two Emmy nominations! They were for Special Visual Effects for a Drama Series. One was for Air and one was for Space. Too bad you are competing against yourself! Thanks so much to Mike Banas for taking the time to answer everyone’s questions. I loved learning some of the basics about TV (and film) editing, and also had a lot of fun reading the personal questions and replies. (Fringe punk bands? Who knew?) – Ruby looks awfully sweet; I hope she does well with the stem-cell procedure, especially since Mike needs her to help carry his workload. Joe, thanks again for setting up another SGU Q&A. Bit by bit, I’m taking in so much info that helps me better appreciate what I see onscreen. Many congrats to Mark Savela and his team for the VFX Emmy. They’ve done awesome (not to mention jaw-dropping) work from the start. Just a quick hello to tell you Joe to check your email…I’ve got an idea to float. Do you think the popularity of the iPhone will mean we see the extinction of the bound in the back of the van, a team effort to get the phone out of a pocket and feel the keys to dial for help storyline? Whaat? I didn’t get my memo to send q’s for him. But a very interesting read nevertheless. Can we expect some AU SGU stories to come? I’m dying to see what would have become of the character had they not gotten stranded on the Destiny. Before I read comments, thanks to MB for the Q&A. Hearing from crew is like watching “Ace of Cakes” or “Dirty Jobs”, educating and entertaining us on the *pontification warning* wide variety of human endeavor. Michael Shanks is an incredible actor, would he or anyone on the SG writers staff ever consider him as the main lead for a fourth stargate series? What might a fourth stargate be about/be set? I have nothing really important to say, but I did want to note that I found this Q&A fascinating. 5. The moon base, which Sam speaks about in Continuum…Are we going to see it in the next movie? Has the Earth Gate beeing moved to the moon? Would be great, if you find time for answering the questions. Sorry for bad english, hope you understand everything. Thanks for the Q & A! It is interesting “seeing” behind the scenes. Also, Ruby is a cutie! Good luck to Ruby on her treatments. I worked at the humane society Wednesday and I wish all the dogs/cats there would be as lucky in owners as Ruby, and Mr. M.’s dogs. No worrys. I wish you all the luck in the world. If anything it’s a complete and utter shame that more SG1/Atlantis movies haven’t been made. Cool, guy, very diplomatic, that was nice of Mike to answer those questions as busy as he is. His wife is very pretty and Ruby is an amazing dog. That’s good she helps out in the office. Great Q&A. I find the entire process of production from the idea stage to the end product extremely fascinating, and the editing process is no exception. Don’t know if I could handle the uncertainty of employment, though. Hey Mike – thanks for taking the time to do a Q & A, and shedding some light on the behind the scenes action. I think I need to rethink my career I would actually enjoy ….working in a dark room by myself like a troll…. sounds like my idea of heaven!! That’s a really good picture of Jennifer and Ruby. I hope all goes well with Ruby’s procedure(s). It’s always hard to know what to do with pets and their treatment. You want them to get better, but you also don’t want them to be in pain….tough decisions. Yes.. Every time i go over old records (to see if i missed anything in the past about the movies) its like a kick in the balls. I mean I read how MGM was excited and ready to go with these movies and agreed to finance it (in a lot of the May entries of this blog ’09) and then things went dead. I mean.. I still don’t know what happened in may/june that made them change their mind and their commitment. Its just sad that SGA was promised to be continued in a different format but it hasn’t happened yet (yet) I still think it will happen.. just we won’t get as many movies then if MGM actually stuck to what they committed in a the press release. If they’re gonna commit to it they should follow through, even if it means them spending what little money they had on the movies. But id be perfectly happy if we only get Revolution and Extinction (though id like more if possible) and I believe its worth our time and effort fighting for. After rewatching a few key episodes from Season 1 I thought I might offer some comments and constructive criticism if I may. 1) A lot was made about the speed at which Chloe and Scott got together, I think this was unfair – look at the timeline and the pressure there under – what I would say is that clearly there where some very touching moments between Chloe and Scott that occurred off-camera to get them to where there relationship is at the beginning of Light. It would have been nice to have seen more of those. 2) Whilst it’s commendable that the show aims not to lay everything out for the viewer, sometimes I think it can go too far – for example we never see anyone discover the remotes can be used to dial the seeded gates – that felt slightly “off”, that there was something that fundamental about the ship and it’s technology which all the characters know – but we the audience don’t and have too assume. 3) Eli’s, Scott’s & Chloe’s return to Destiny at the beginning of Sabotage seemed very convenient – now I know it’s explained, and it does make sense, but for me it really undercut all the dramatic tension that was built up during the final moments of Lost. And thats all I got, otherwise a great season for TV, looking forward to the next one. Just some more standard questions. 1) Will we learn more about the Lucien Alliance in future episodes? I’m curious to know if it’s only this group led by Kiva that is pursuing Destiny or if it’s an obsession for the whole Alliance? 3) Given the tight running time every episode has too keep too, and the shows aim to treat the audience with more respect was there any talk of dropping the “previously” segments? Or is it something the network simply won’t let you drop? Joe, I had a thought. (I know…scary) But it’s just a thought. After reading Mike’s Q&A, it made me have more questions that I would have loved for him to answer. But, alas, I’m too late now. Which leads me to my brilliant idea. Would you ever consider doing a sort of live Q&A with someone on your blog. Lets say one evening you let us ask this person questions (in your comments section) and they answer them right away (in your comments section). You could have rules like, only one question per person per 1/2 hour or something like that, and every 10 minutes or so, you post everything so far. That sounds like fun to me! Can we, can we! And don’t forget the other idea I had that you said you would do, but you haven’t done it yet. I asked that instead of writing your blog one night, you video yourself doing it. That would be fun too. Instead of posting a picture, you could just hold them close to the camera. And don’t say you forgot! Don’t make me have to go find where you said you would do it! I can’t help it Joe. You’re just so much fun!